This charming house is located in the small town of Colònia de Sant Pere, which belongs to the municipality of Artà. The town is situated in the northeastern tip of Marllorca with its beautiful sandy beaches. Enjoy the serenity the environment has to offer and of course the stunning views over the Mediterranean Sea. 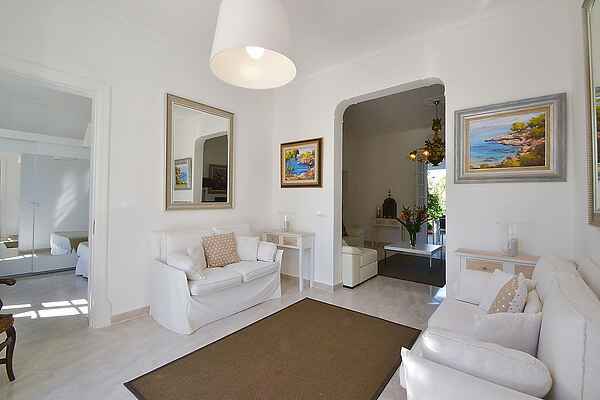 This delightful holiday home is built in a Mediterranean style with a matching, fresh decor. It is equipped with all modern amenities you will need and it is perfectly qualified for families with children. It has tree double bedrooms and two bathrooms, of which one is accessible from the outside. You will also poses a fully equipped kitchen with dining area, a spacious living room and even an extra sitting room. Furthermore, the house offers you Wi-Fi, air-conditioning and fans. For hikers, this house is a perfect starting point: take a walk across the seashore, or choose to do an exciting mountain route. Take a rest during the Mediterranean summer evenings, outside in your beautiful garden on one of your private terraces, which are equipped with comfortable garden furniture.